This evening BBC1 will be screening The Bomber Boys about the men of Bomber Command in the Second World War. It is often forgotten that there were bombers operated by the RAF in the Great War, used to bomb targets on or behind the battlefield or much deeper into enemy territory. When the Great War broke out aircraft were un-armed and used in a reconnaissance role. German Zeppelins brought the first bombs onto targets away from the battlefield, and by 1917 the Germans had developed the Gotha bomber capable of making bombing runs on Britain from bases in Belgium. By 1918 the British used a number of aircraft to bomb Germany, the DH9 being one of the workhorses and used in combat by, for example, 99 Squadron RAF who bombed the city of Saarbrücken in Germany in July 1918. 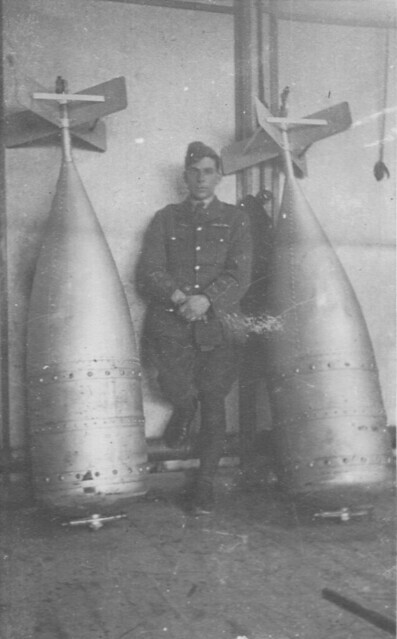 This image comes from a small collection owned by a veteran of the RAF who flew in 1918 and shows one of his fellow pilots with two 500lb bombs; again the size of bombs used in WW1 is surprising considering the nature of the aircraft. The early pilots and crews of these bomber squadrons paved the way for the next generation of Bomber Boys, many of whom had read the adventures of Great War pilots while at school in the 20s and 30s. This entry was posted on 05/02/2012 by sommecourt. It was filed under France, Great War, Royal Air Force, Western Front, WW1 and was tagged with 1918, Bomber Boys, Bombers, RAF, WW1. William Nixon Wilson, my great uncle, was a WW 1 bomber and Flight Lieutenant age 19. A few photographs of him by his Dehavilland Bomber and photos of some of the destruction he caused on German railway lines are here : http://www.getjackback.wordpress.com and in my FlickR account ‘my mind bursts’. Having joined up as infantry and serving 2 1/2 years in the Machine Gun Corps my grandfather John Arthur Wilson successfully transferred to the RAF and completed Fighter Pilot training. Postcards and photos of his experience are also shared online.